Not far off the heels from last week’s Chevrolet Traverse dealership horror story, and a Camaro rental car rip-off comes another tale. And it reminds us that when you can’t leave people to their own sense of integrity, especially when they’re involved with maintaining your property, sometimes it’s best to take precautionary measures to ensure everything is taken care of properly when you’re not on watch. 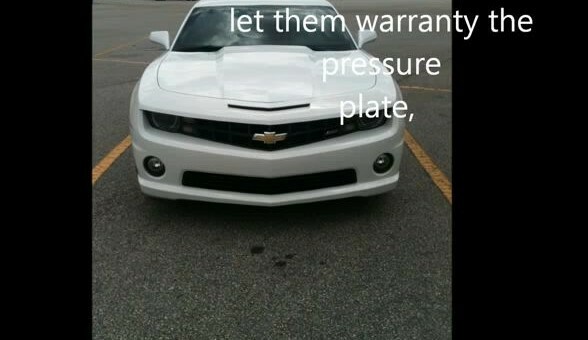 That’s what this Chevrolet Camaro SS owner decided to do by placing a recording device in his vehicle when he left it to Best Chevrolet in Easley, South Carolina to evaluate a clunking noise in the manual transmission. What he chronicled is pretty awful. Before you listen to the recording, this is your obligatory NSFW warning. There is strong language spoken from the service crew. The dealer employees spent 20 minutes joyriding in the 426-horsepower coupe, and instead of evaluating the car for an issue, they thrashed the car and fried the clutch — as evident from the voice recording. It gets worse. Towards the end, the service workers plot to bill the customer for replacement parts and charge General Motors for warranty work as well. “If it was me, I’d write this f****** up at him buying a clutch for it… him buying a clutch disk, let them warranty the pressure plate, bill them in on two days later so I’ll get paid to put a clutch in it and then get paid to put a pressure plate in it,” according to the recording. Smooth. Listen to it all unfold in the video below, and voice your opinion on what should happen next in the comment section underneath. Is this form of *evaluation* acceptable in your eyes? Previous story Is GM’s ‘Shop-Click-Drive’ A New Online Sales Initiative? 1) These ‘technicians’ should be released with cause from their employment. 2) The Dealer principle should be having a very serious conversation with his GM rep as to why they should continue to be a GM dealer. 3) This car should be replaced at the Dealer’s expense. 4) This car should be sold as an exec driven. 5) No one should ever drop off a manual or high performance vehicle without staying with the vehicle or without placing a recording device in the car. As a public service it’s being reported elsewhere that the dealership involved in Best Easley Chevrolet in Easley South Carolina. Manoli, it would be a great demonstration of your journalism if you could contact them and ask them to comment on this report. This not only hurts the owner of this car, but also supports the notion that they are stealerships not dealerships. I see, in my crystal ball, two out of work technicians, a dealer that gets a serious audit from GM and perhaps Chevrolets name pulled off the building, and a customer that gets free lifetime service, an extended warranty well beyond the 100,000 mile powertrain warranty that is already on the car and new tires. Or, a new car. His choice. If I were the customer I would demand a ZL1. Thanks for posting this! The only Chevrolet dealer in my town has a poor reputation as well. When I buy my next vehicle, I will definitely shop around to as many dealers as it takes to be treated without any up front BS. News stories like these make me wonder what the ultimate criteria was for keeping/closing dealerships back in ’08/’09. This Story is going/has gone viral. I hope the Camaro owner is able to get this resolved to his complete satisfaction. btw, his replacement car better have a new car smell and not flatus. 1. Taking action against this dealership to make an example. 2. Taking steps in its policies to make sure something like this never happens again. I would sue and demand for them to keep the car and replace it with a 2013 2lt SS…1le with life time maintenance and free tire replacement…. I just saw the video when i got home form work. MANN I’M PISSED FOR YOU!!! If i were you I would demand to see them two fired right in front of me. sue both of them, the dealership, then demand a 2013 Camaro of your Choice and demand free service for life at another Chevy Dealer. Then A personal Apology from the owner of the dealership while you take the keys of your new 2013 Camaro.. I contacted Best Chevrolet in Easley, SC and they had no comment except that ” the incident is under investigation”. Please contact GM and tell them of your disdain for such treatment of customer’s cars. Remember – many will view this story with disgust. Few will act up and contact GM to express their feelings re: their dealerships. This effects how everyone everywhere views their local GM dealership, makes us all wonder what goes on after we drop off our car. Get the word out. Post this link on your favorite Chevy forum. There is far too much of this sort of thing (maybe not this extreme) going on at Chevy dealerships around the country. The EXACT same thing happened to my mom’s 2011 SS!!!!! We took it back in to Jeff Schmitt Chevy to have the stripes put on, and she brought it over to show me after they got it all done. I took one look at the car, and noticed rubber all over the quarter panels. I WAS PISSED!!!!!!! Not having a recorder in that car was a good and bad thing. Good for the health of the S^^^head that abused it, and bad for the lack of evidence. I will NEVER go back to that dealer, and I hope by the time you’re done with the jackasses in South Carolina, your name is on the dealership, instead of the owner’s name! I reported our incident to GM customer service, and I will be calling to voice my opinion on yours. THIS HAS TO STOP! Take them for EVERYTHING you can get! You worked hard to buy that car, there’s no reason some loser should trash it!!!! Did someone make you take down the video? When I tried to play it, a message comes up that says “this video is private”. The video has been made private, so I’m guessing that more than a few lawyers have been involved, and a settlement reached. This is sad, and it really makes me question the GM car I purchased. I’ve been dealing with the steering and a clunk in the gearbox of my 2012 GS. I’ve always wondered if perhaps the dealership joy rode the car. The car was ordered by me and had 14 miles on it when I picked it up. I am so glad this owner put the recording device in his car. He might very well have now saved others from dealing with a similar situation. It’s a shame that you can’t even trust dealerships now. GM is going to pull a Dealer Agreement over this! Lets get real…. The money the dealer makes for GM far outweighs what to idiot service techs did. You people do understand that a clutch is seperate from a pressure plate and does not neccessarily be replaced at the same time? So as far as “fraud” its doubtful. I think next time if i put my car on service I will just record my miles first and then put surveillance camera on the car. The worst part is that the owner of the store has not offered to buy the vehicle back. They have only offered to look into the situation. Being a General Sales Manager for 3 stores currently it could cost him hundreds of thousands if he does not make this right. The techs involved should be fired and the customer taken care of. I am sure the General Motors fixed ops rep is hanging out at this dealership for the next 6 months or so.